I read this article and found it very interesting, thought it might be something for you. The article is called Delhi’s Amazing Story Of A Hospital That Isn’t and is located at https://archive.indiaspend.com/sectors/delhis-amazing-story-of-a-hospital-that-isnt-31649. Healthcare spending in India is abysmally low. But that’s not the only problem. IndiaSpend recently reported on the status of an ambitious project to replicate the Delhi-headquartered All India Institute of Medical Sciences (AIIMS) in 8 centres across the country. That project was launched in 2004 at a cost of Rs 2,600 crore ($577 m) and 6 centres were to be ready by 2011. As of now, none are ready and most of them are only a third complete. But AIIMs is a 7-year saga. There are others which have stretched longer and not even got as far. The Delhi-based Dwarka hospital project is a case in point where Rs 14.2 crore has been spent over 14 years but there is no hospital yet. In 1996, Delhi’s Department of Health (DoH) decided to construct a 500-bed hospital in the Dwarka area through the Public Works Department. A year later, the land for this was allotted (in March 1997) by the Delhi Development Authority (DDA) at a modest cost of Rs 3.90 crore. It took 3 years for the preliminary drawings to be prepared and approved by the Directorate of Health Services (DHS) in July 2000. Another year passed as the approval of the Delhi Urban Art Commission was received in March 2001. Incidentally, the DUAC (which has 30 people working for it) was set up by Parliament to advise on “preserving, developing and maintaining the aesthetic quality of urban and environmental design within Delhi”. The state Government’s Expenditure Finance Committee (EFC) and the state’s cabinet approved the proposal in August and November 2004, respectively. An administrative approval and expenditure sanction of Rs 124 crore was `conveyed’ in December 2004. Seven months later in June 2005, the Chief Engineer, PWD-I `intimated’ an increase in the size of the property through a change in Floor Area Ratio from 150 to 200 per cent.Two years passed. 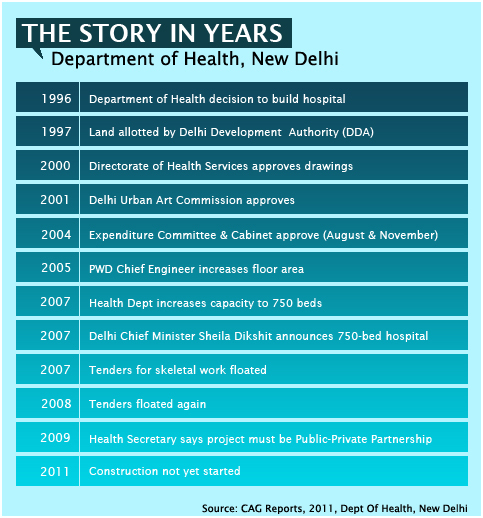 In November 2007, Delhi Chief Minister Sheila Dixit announced a 750-bed hospital (now christened the Bharat Ratna Indira Gandhi Hospital) and said it would be constructed on a 15-acre plot in Dwarka and was expected to be operational by 2010. “Since the Dwarka hospital is planned as a major facility for a sub-city of one million people, the Cabinet considered it appropriate to go in for a state-of-the-art facility which would serve the population over the next 50 to 100 years,” newspapers reported Ms Dikshit as saying. A revised estimate for Rs 350 crore for constructing the hospital was approved by the Health Department in November 2007. Tenders for ‘skeletal’ construction of the hospital at Dwarka were floated in July 2007. They did not get ‘approved’ because of poor response. The tenders were called again in January and May 2008 but were not accepted pending approval of revised plans from local bodies. It’s not clear which plans these were. Along the way, in May 2008, the Delhi Government awarded a contract for base isolators (buffer structures which help protect buildings against earthquakes) for Rs 8.90 crore. A total of 530 base isolators arrived, from January 2009 to January 2011. A total of Rs 12.66 crore was paid out for these, including import duty of Rs 2.97 crore. It’s not clear from the Comptroller & Auditor General (CAG) report that looks at this transaction why the order for the base isolators preceded other tenders. Since the base isolators (bearings) had arrived, they were to be kept in safe custody. The PWD then built a store in March 2009 for Rs 3.83 lakh and spent another Rs 4.57 lakh in `watch and ward’ for the bearings from April 2009 to January 2011. Despite the watch and ward, the store was robbed when, in June 2009, thieves made away with 20 bearings worth Rs 16 lakh. The bearings were subsequently insured, for Rs 3.45 lakh. In all, the CAG concludes, Rs 25.62 lakh was spent on security and safety of the bearings. Twelve years after conceptualisation, in April 2009 , Delhi’s Principal Secretary (Health) told the Chief Engineer not to invite any tender as the Delhi Government’s fiscal situation had changed (presumably deteriorated) and that this project should be taken in the form of a public private partnership (PPP). Incidentally, the ‘revised plans from the local bodies’ were not approved as of February 2011. In March 2010, the Delhi Finance Minister A K Walia announced the setting up of three 200-bed hospitals at Vikaspuri, Burari and Ambedkar Nagar and also mentioned a 750-bed hospital at Dwarka, all while presenting his budget. To be fair to the Delhi Government, it would also appear that other hospitals being developed in and around the capital are moving faster, as a cursory reading of the Delhi Government’s Budget Speech for 2010-11 suggests. The people of Dwarka will evidently have to wait longer though.